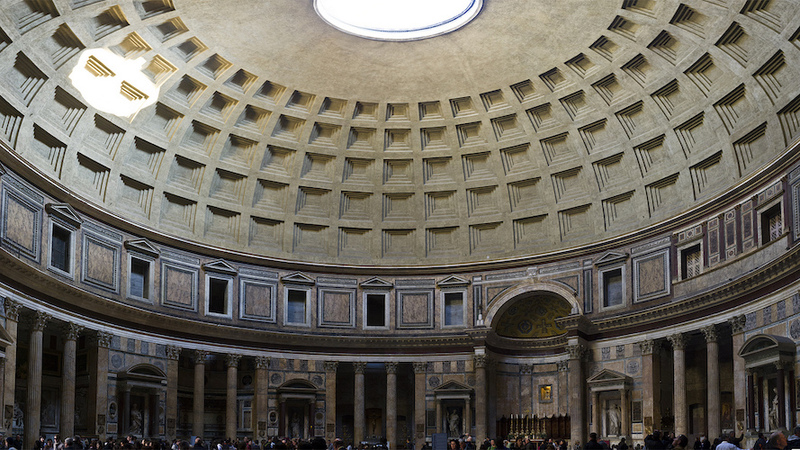 The Pantheon in Rome is a true architectural wonder. Described as the “sphinx of the Campus Martius”—referring to enigmas presented by its appearance and history, and to the location in Rome where it was built—to visit it today is to be almost transported back to the Roman Empire itself. The Roman Pantheon probably doesn’t make popular shortlists of the world’s architectural icons, but it should: it is one of the most imitated buildings in history. For a good example, look at the library Thomas Jefferson designed for the University of Virginia. While the Pantheon’s importance is undeniable, there is a lot that is unknown. With new evidence and fresh interpretations coming to light in recent years, questions once thought settled have been reopened. Most textbooks and websites confidently date the building to the Emperor Hadrian’s reign and describe its purpose as a temple to all the gods (from the Greek, pan = all, theos = gods), but some scholars now argue that these details are wrong and that our knowledge of other aspects of the building’s origin, construction, and meaning is less certain than we had thought. The conventional understanding of the Pantheon’s genesis, which held from 1892 until very recently, goes something like this. Agrippa built the original Pantheon in honor of his and Augustus’ military victory at the Battle of Actium in 31 B.C.E.—one of the defining moments in the establishment of the Roman Empire (Augustus would go on to become the first Emperor of Rome). It was thought that Agrippa’s Pantheon had been small and conventional: a Greek-style temple, rectangular in plan. Written sources suggest the building was damaged by fire around 80 C.E. and restored to some unknown extent under the orders of Emperor Domitian (who ruled 81-96 C.E.). When the building was more substantially damaged by fire again in 110 C.E., the Emperor Trajan decided to rebuild it, but only partial groundwork was carried out before his death. Trajan’s successor, Hadrian—a great patron of architecture and revered as one of the most effective Roman emperors—conceived and possibly even designed the new building with the help of dedicated architects. It was to be a triumphant display of his will and beneficence. He was thought to have abandoned the idea of simply reconstructing Agrippa’s temple, deciding instead to create a much larger and more impressive structure. And, in an act of pious humility meant to put him in the favor of the gods and to honor his illustrious predecessors, Hadrian installed the false inscription attributing the new building to the long-dead Agrippa. Today, we know that many parts of this story are either unlikely or demonstrably false. 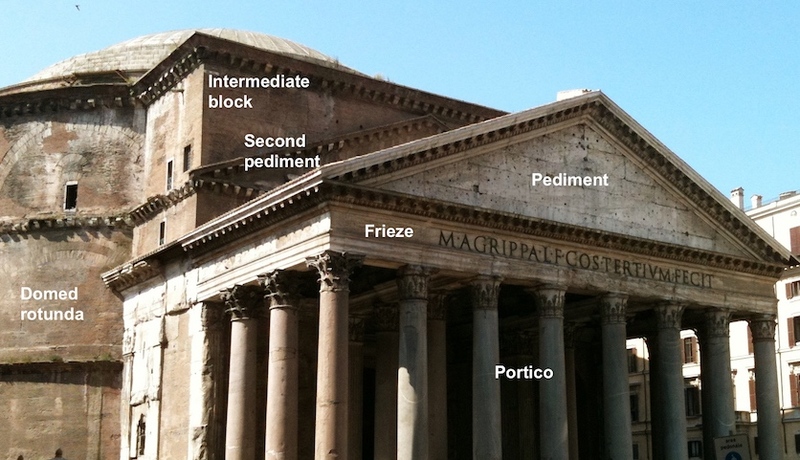 It is now clear from archaeological studies that Agrippa’s original building was not a small rectangular temple, but contained the distinctive hallmarks of the current building: a portico with tall columns and pediment and a rotunda (circular hall) behind it, in similar dimensions to the current building. More startling, a reconsideration of the evidence of the bricks used in the building’s construction—some of which were stamped with identifying marks that can be used to establish the date of manufacture—shows that almost all of them date from the 110s, during the time of Trajan. Instead of the great triumph of Hadrianic design, the Pantheon should more rightly be seen as the final architectural glory of the Emperor Trajan’s reign: substantially designed and rebuilt beginning around 114, with some preparatory work on the building site perhaps starting right after the fire of 110, and finished under Hadrian sometime between 125 and 128. Lise Hetland, the archaeologist who first made this argument in 2007 (building on an earlier attribution to Trajan by Wolf-Dieter Heilmeyer), writes that the long-standing effort to make the physical evidence fit a dating entirely within Hadrian’s time shows “the illogicality of the sometimes almost surgically clear-cut presentation of Roman buildings according to the sequence of emperors.” The case of the Pantheon confirms a general art-historical lesson: style categories and historical periodizations (in other words, our understanding of the style of architecture during a particular emperor’s reign) should be seen as conveniences—subordinate to the priority of evidence. What was it—a temple? A dynastic sanctuary? 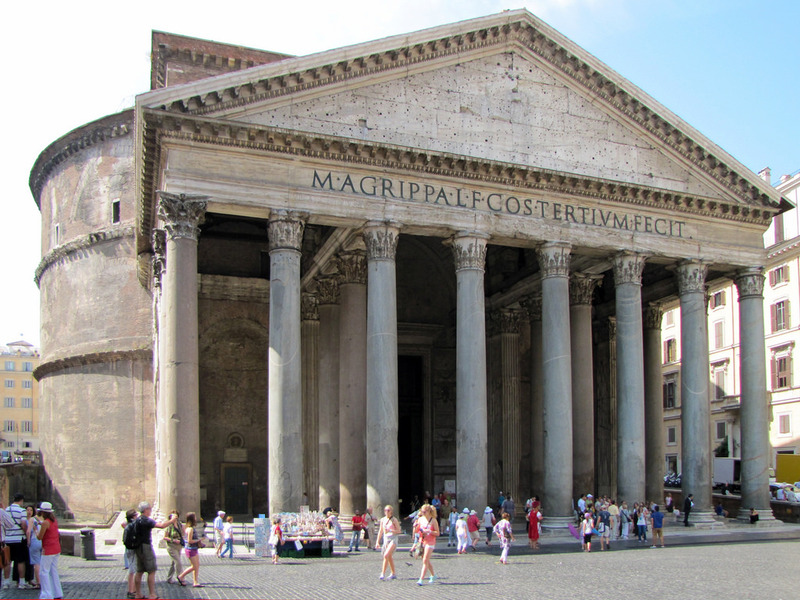 He [Agrippa] completed the building called the Pantheon. It has this name, perhaps because it received among the images which decorated it the statues of many gods, including Mars and Venus; but my own opinion of the name is that, because of its vaulted roof, it resembles the heavens. Agrippa, for his part, wished to place a statue of Augustus there also and to bestow upon him the honor of having the structure named after him; but when Augustus wouldn’t accept either honor, he [Agrippa] placed in the temple itself a statue of the former [Julius] Caesar and in the ante-room statues of Augustus and himself. This was done not out of any rivalry or ambition on Agrippa’s part to make himself equal to Augustus, but from his hearty loyalty to him and his constant zeal for the public good. 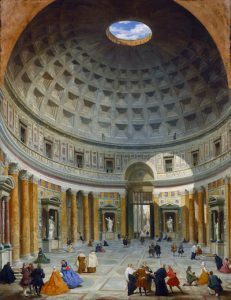 A number of scholars have now suggested that the original Pantheon was not a temple in the usual sense of a god’s dwelling place. Instead, it may have been intended as a dynastic sanctuary, part of a ruler cult emerging around Augustus, with the original dedication being to Julius Caesar, the progenitor of the family line of Augustus and Agrippa and a revered ancestor who had been the first Roman deified by the Senate. Adding to the plausibility of this view is the fact that the site had sacred associations—tradition stating that it was the location of the apotheosis, or raising up to the heavens, of Romulus, Rome’s mythic founder. Even more, the Pantheon was also aligned on axis, across a long stretch of open fields called the Campus Martius, with Augustus’ mausoleum, completed just a few years before the Pantheon. 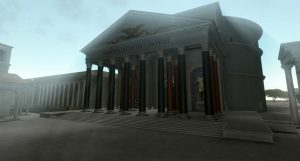 Agrippa’s building, then, was redolent with suggestions of the alliance of the gods and the rulers of Rome during a time when new religious ideas about ruler cults were taking shape. By the fourth century C.E., when the historian Ammianus Marcellinus mentioned the Pantheon in his history of imperial Rome, statues of the Roman emperors occupied the rotunda’s niches. In Agrippa’s Pantheon these spaces had been filled by statues of the gods. 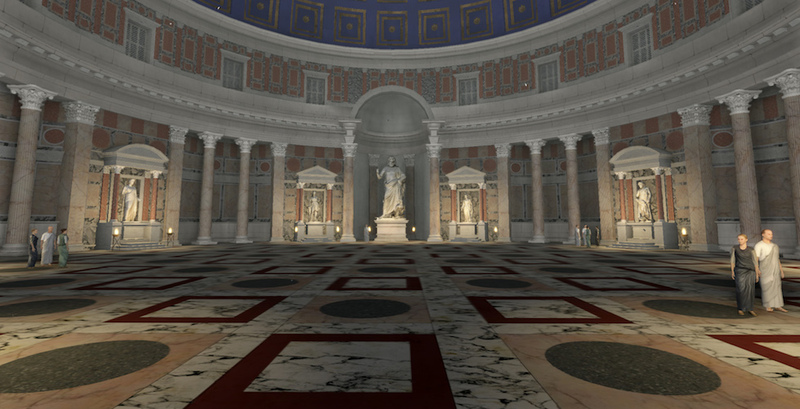 We also know that Hadrian held court in the Pantheon. 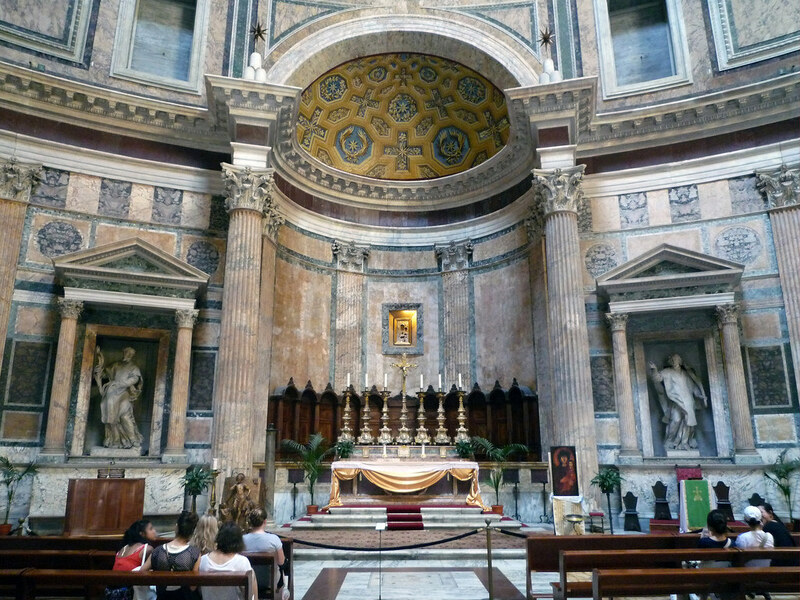 Whatever its original purposes, the Pantheon by the time of Trajan and Hadrian was primarily associated with the power of the emperors and their divine authority. The symbolism of the great dome adds weight to this interpretation. The dome’s coffers (inset panels) are divided into 28 sections, equaling the number of large columns below. 28 is a “perfect number,” a whole number whose summed factors equal it (thus, 1 + 2 + 4 + 7 + 14 = 28). Only four perfect numbers were known in antiquity (6, 28, 496, and 8128) and they were sometimes held—for instance, by Pythagoras and his followers—to have mystical, religious meaning in connection with the cosmos. Additionally, the oculus (open window) at the top of the dome was the interior’s only source of direct light. The sunbeam streaming through the oculus traced an ever-changing daily path across the wall and floor of the rotunda. Perhaps, then, the sunbeam marked solar and lunar events, or simply time. The idea fits nicely with Dio’s understanding of the dome as the canopy of the heavens and, by extension, of the rotunda itself as a microcosm of the Roman world beneath the starry heavens, with the emperor presiding over it all, ensuring the right order of the world. How was it designed and built? The Pantheon’s basic design is simple and powerful. A portico with free-standing columns is attached to a domed rotunda. In between, to help transition between the rectilinear portico and the round rotunda is an element generally described in English as the intermediate block. This piece is itself interesting for the fact that visible on its face above the portico’s pediment is another shallow pediment. 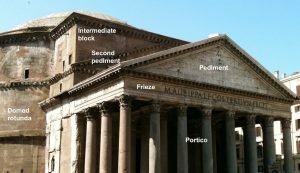 This may be evidence that the portico was intended to be taller than it is (50 Roman feet instead of the actual 40 feet). Perhaps the taller columns, presumably ordered from a quarry in Egypt, never made it to the building site (for reasons unknown), necessitating the substitution of smaller columns, thus reducing the height of the portico. The Pantheon’s great interior spectacle—its enormous scale, the geometric clarity of the circle-in-square pavement pattern and the dome’s half-sphere, and the moving disc of light—is all the more breathtaking for the way one moves from the bustling square (piazza, in Italian) outside into the grandeur inside. One approaches the Pantheon through the portico with its tall, monolithic Corinthian columns of Egyptian granite. Originally, the approach would have been framed and directed by the long walls of a courtyard or forecourt in front of the building, and a set of stairs, now submerged under the piazza, leading up to the portico. Walking beneath the giant columns, the outside light starts to dim. As you pass through the enormous portal with its bronze doors, you enter the rotunda, where your eyes are swept up toward the oculus. The structure itself is an important example of advanced Roman engineering. Its walls are made from brick-faced concrete—an innovation widely used in Rome’s major buildings and infrastructure, such as aqueducts—and are lightened with relieving arches and vaults built into the wall mass. 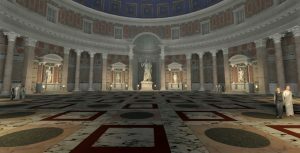 The concrete easily allowed for spaces to be carved out of the wall’s thickness—for instance, the alcoves around the rotunda’s perimeter and the large apse directly across from the entrance (where Hadrian would have sat to hold court). Further, the concrete of the dome is graded into six layers with a mixture of scoria, a low-density, lightweight volcanic rock, at the top. 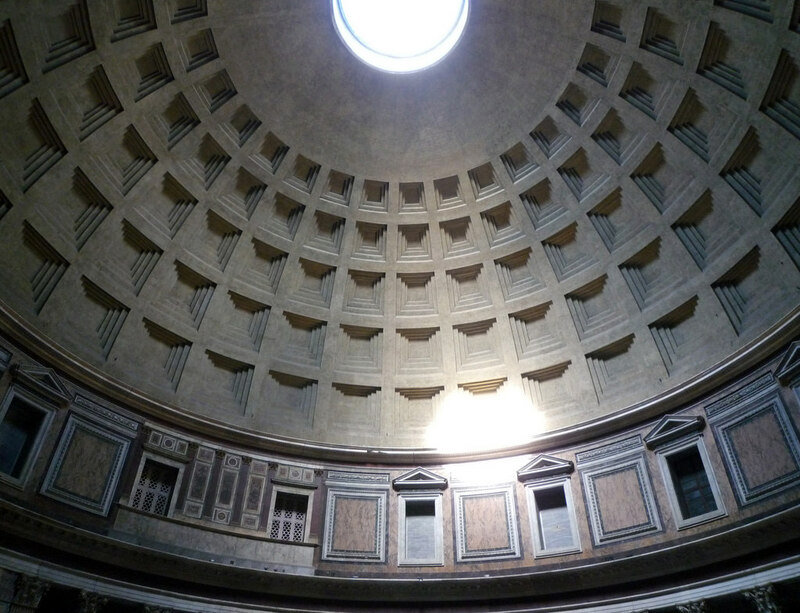 From top to bottom, the structure of the Pantheon was fine-tuned to be structurally efficient and to allow flexibility of design. We do not know who designed the Pantheon, but Apollodorus of Damascus, Trajan’s favorite builder, is a likely candidate—or, perhaps, someone closely associated with Apollodorus. He had designed Trajan’s Forum and at least two other major projects in Rome, probably making him the person in the capital city with the deepest knowledge about complex architecture and engineering in the 110s. On that basis, and with some stylistic and design similarities between the Pantheon and his known projects, Apollodorus’ authorship of the building is a significant possibility. 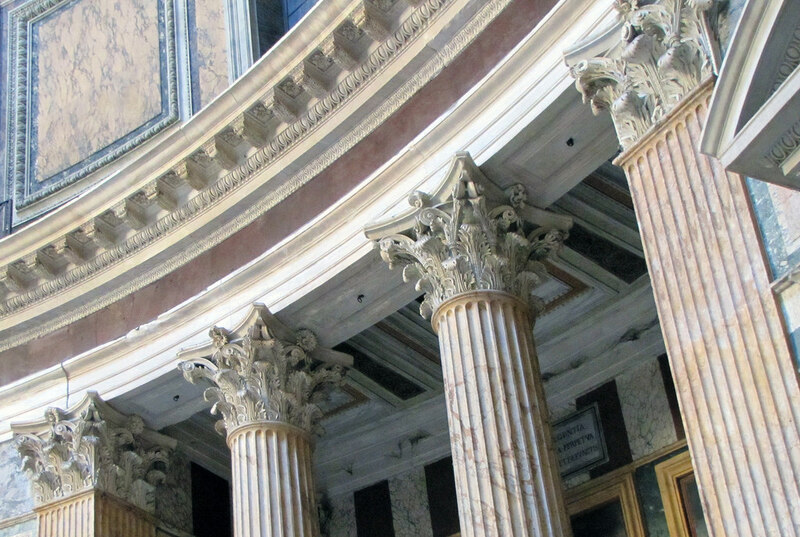 When it was believed that Hadrian had fully overseen the Pantheon’s design, doubt was cast on the possibility of Apollodorus’ role because, according to Dio, Hadrian had banished and then executed the architect for having spoken ill of the emperor’s talents. Many historians now doubt Dio’s account. Although the evidence is circumstantial, a number of obstacles to Apollodorus’ authorship have been removed by the recent developments in our understanding of the Pantheon’s genesis. 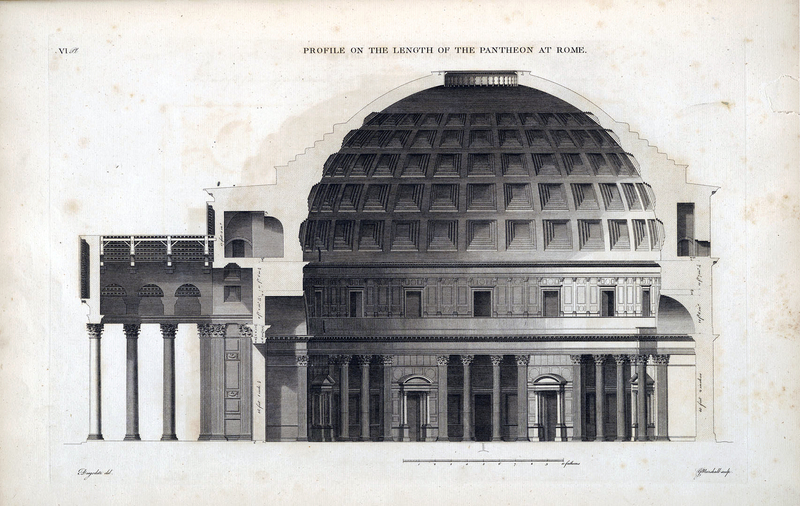 In the end, however, we cannot say for certain who designed the Pantheon. We know very little about what happened to the Pantheon between the time of Emperor Constantine in the early fourth century and the early seventh century—a period when the city of Rome’s importance faded and the Roman Empire disintegrated. This was presumably the time when much of the Pantheon’s surroundings—the forecourt and all adjacent buildings—fell into serious disrepair and were demolished and replaced. 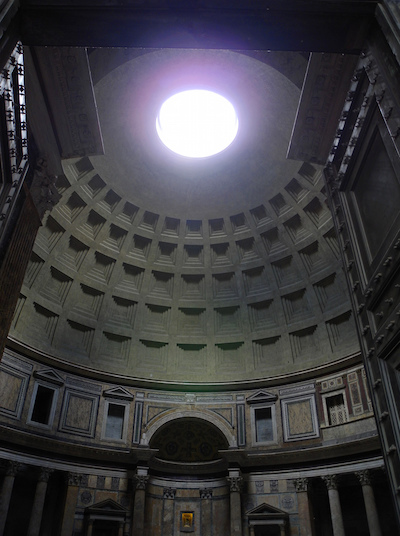 How and why the Pantheon emerged from those difficult centuries is hard to say. The Liber Pontificalis—a medieval manuscript containing not-always-reliable biographies of the popes—tells us that in the 7th century Pope Boniface IV “asked the [Byzantine] emperor Phocas for the temple called the Pantheon, and in it he made the church of the ever-virgin Holy Mary and all the martyrs.” There is continuing debate about when the Christian consecration of the Pantheon happened; today, the balance of evidence points to May 13, 613. 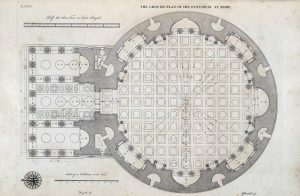 In later centuries, the building was known as Sanctae Mariae Rotundae (Saint Mary of the Rotunda). Whatever the precise date of its consecration, the fact that the Pantheon became a church—specifically, a station church, where the pope would hold special masses during Lent, the period leading up to Easter—meant that it was in continuous use, ensuring its survival. Yet, like other ancient remains in Rome, the Pantheon was for centuries a source of materials for new buildings and other purposes—including the making of cannons and weapons. In addition to the loss of original finishings, sculpture, and all of its bronze elements, many other changes were made to the building from the fourth century to today. Among the most important: the three easternmost columns of the portico were replaced in the seventeenth century after having been damaged and braced by a brick wall centuries earlier; doors and steps leading down into the portico were erected after the grade of the surrounding piazza had risen over time; inside the rotunda, columns made from imperial red porphyry—a rare, expensive stone from Egypt—were replaced with granite versions; and roof tiles and other elements were periodically removed or replaced. 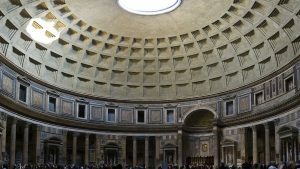 Despite all the losses and alterations, and all the unanswered and difficult questions, the Pantheon is an unrivalled artifact of Roman antiquity. Mary T. Boatwright, “Hadrian and the Agrippa Inscription of the Pantheon,” in Hadrian: Art, Politics and Economy, edited by Thorsten Opper (London: British Museum, 2013), pp. 19-30. Paul Godfrey and David Hemsoll. “The Pantheon: Temple or Rotunda?” in Pagan Gods and Shrines of the Roman Empire, edited by Martin Henig and Anthony King (Oxford: Oxford University Committee for Archaeology, 1986), pp. 195-209. Robert Hannah and Giulio Magli. 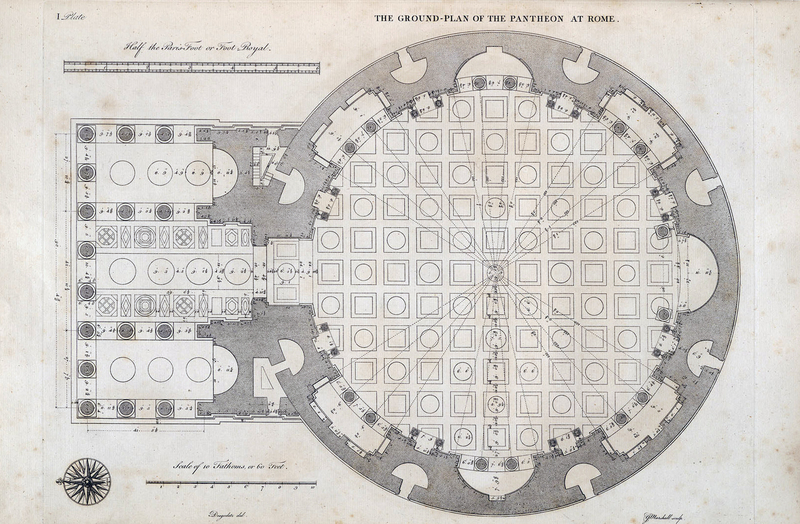 “The Role of the Sun in the Pantheon’s Design and Meaning,” Numen 58 (2011), pp. 486-513. Lise M. Hetland, “Dating the Pantheon,” Journal of Roman Archaeology 20 (2007), pp. 95-112. Tod A Marder and Mark Wilson Jones, editors, The Pantheon from Antiquity to the Present (Cambridge: Cambridge University Press, 2015).